Mar 23 What Makes Influencers Want to Work with Brands? We've understood why marketers are working with influencers, but what makes an influencer want to continue to work with brands? About ten years ago, brands started to realize that bloggers and people with “influence” could help them reach customers who were not responding to traditional advertising methods and who responded well to third-party endorsements. Influencer marketing has come a long way in ten years – particularly in terms of what influencers want from the brands they’re working with and how the two can effectively work together. Influencers now have a lot of the power and can call the shots a lot more than they once did. We work with high-quality content creators (also known as influencers and bloggers) and some of the world’s best-known brands every day so we see some great relationships develop. We have also seen some brands expecting the impossible from their influencers. The best relationships often result in the influencer becoming an ambassador for the brand – something that’s extremely valuable for the influencer, the brand and the audience. So what makes influencers more likely to work with one brand over another? And what makes brands attractive to influencers? How can you look after your relationship with your influencers so they remain loyal to you? Crowdtap recently asked content creators what mattered most when teaming up with companies and which factors made them want to work with brands more than once. Here are four insights (and our perspective on them). Hooray! Forty-four percent of influencers polled in the Crowdtap study said the biggest motivating factor in working with a brand was creating content that's relevant to their audience. These content creators recognize that their value to their audience comes from their authentic and honest nature. For them, their audience comes first. While some “creatives” might be tempted by big money from influencer campaigns — some of the biggest names in the social sphere receive crazy amounts for branded posts — a sizeable (and increasing) chunk of influencers understand that their followers want relevant content. This confirms what we said in a recent blog post about celebrity endorsements: consumers prefer authentic influencers with a passion for their niche, rather than irrelevant content from overpaid stars. In a recent webinar, we talked to four popular millennial influencers about their relationships with brands. All of these influencers have worked hard to build a loyal following among their audience. This means that they want to keep providing their audience with valuable content that’s relevant to their own life and those of their followers. Relevant content is actually what makes influencer marketing work … so this is something that should make brands feel more comfortable about wading into the influencer pool. 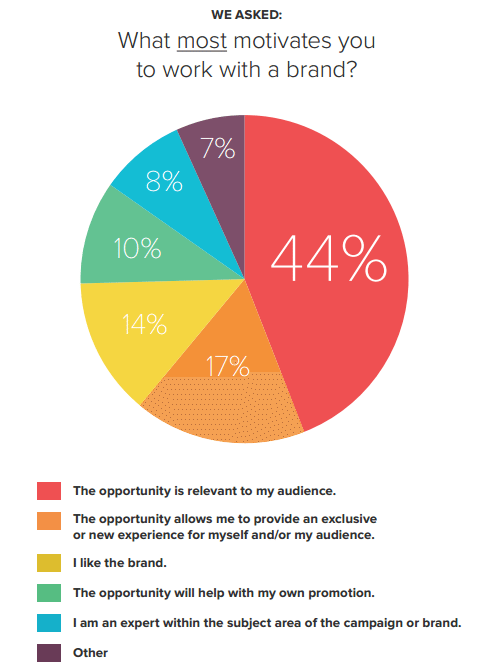 A smaller but still significant seventeen percent of influencers said their top motivating factor in working with brands is to create content that offers their audience an "exclusive or new experience." Influencer marketing works particularly well for product launches or promotions. These skilled content creators are great at getting timely messages out about something that’s new and making it desirable. Think YouTube stars, like beauty guru Michelle Phan and video gamer Evan Fong, who constantly churn out innovative, click-worthy videos. They always upload inventive content. It’s important to note that exclusive content doesn't work all the time. That's why we test all our campaign content and only syndicate the most engaging. We then aggregate the best-received content so it produces results long into the future. 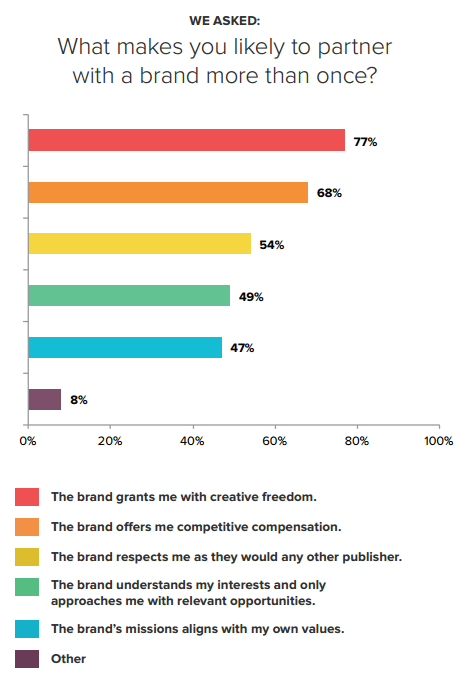 Seventy-seven percent of influencers in the Crowdtap survey cited "creative freedom" when asked why they work with brands more than once. Successful influencers want control over the content they produce – and this is actually something that brands should be looking for. 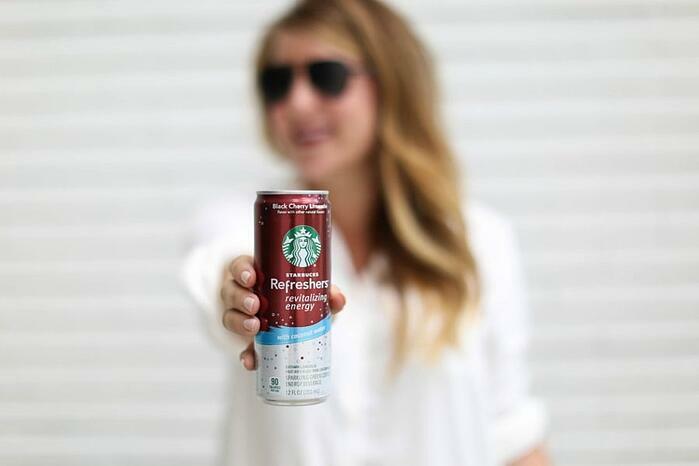 When big brands start to interfere with influencer content, things start to become messy. Consumers are already wary of big companies: 30 percent of them don't trust brand information on Facebook and 25 percent are suspicious of brand content on Twitter. The influencers we talked to in our recent webinar all agreed that creative freedom is a must in their field. “It’s not going to be organic if there are too many rules. I still need creative freedom. We know our audiences the best. There needs to be a balance,” said Amy Loochtan of Coffee Beans & Bobby Pins. Our perspective? It all comes back to respect. The brands are working with the influencers in the first place because they respect them: their creative approach, their perspective, their audience and their ability to deliver a point of view to an audience that they have trouble reaching. As a relatively new marketing discipline, influencer marketing doesn’t yet have a hard and fast set of rules. Over two-thirds of the influencers polled in the Crowdtap survey suggested that appropriate compensation goes a long way towards making them want to continue working with brands. Our webinar participants agreed: “It’s really important for brands to have a budget in mind. There’s always room for negotiation but there needs to be an understanding that a lot of work goes into these posts. I recommend brands keep the dialog open with regards to budget and finances,” stated Taylor Walker of Taylor Walker Fit. Where once brands could provide free product, and get a write-up in return, that’s no longer enough. If they want to work with influencers who treat their blog and social pages as a viable business, they need to be prepared to pay the going rate. Influencers often exist because of brands … without the compensation that brands provide, most of these creatives couldn’t afford to keep their virtual doors open. The important thing for brands is to recognize the things that influencers need to stay authentic and relevant, and provide an environment where their creativity can flourish. New and different perspectives on branded content can prove extremely valuable. Listen to our full webinar here.